With trying to find healthier ways of cooking, made me think of this a Gluten-Free Entree dish that was healthy and refreshing and it was so beautiful, that I had just wanted to stare at its beauty. This is a must try and here is our recipe and if you get a chance to make this Entree, please leave a comment as to your thoughts. First part in making this entree, is toasting the Hazelnuts. Take 6oz’s of Hazelnuts and place a cookie sheet. Place in a 350 degree oven for 10minutes. Let cool, then roughly chop (save 2ounces Hazelnut for the Pesto). Prep the next two recipe’s as you will need them to make the great dish that’s pictured above. Below the next two recipe’s is the how to, on how to put together. Mix all of these ingredients together and store in refrigerator til ready to put the cucumber and crab salad together. Here is our Dill Pesto that goes well in fish entree’s, we used it in our Crab and Cucumber Salad recipe that we will be sharing with you. 3/4c Extra virgin olive oil. – Place all ingredients in a blender an blend until smooth. Some of our recipe’s call for Pickled Red Onions. Which is easy to make and just a small process. 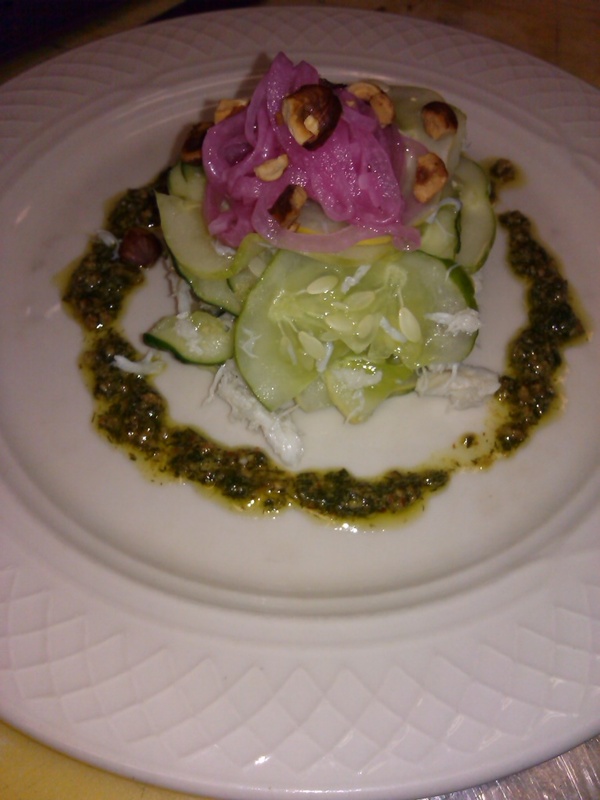 It goes well in our Crab and Cucumber Salad which is pictured here. They are also great on Hamburgers, Salads, Sandwiches. Go ahead and give it a try and please leave us a comment as Would like to hear how you used these refreshing onions. 10 Juniper berries (if its not sold at your local store, your local whole foods co-op may have them). – Boil water, vinegar, sugar, bay leaf, juniper berries, and salt. – Pour over sliced onion and cover tightly. – Top with a few red onions. -Sprinkle with a few toasted hazelnuts. – Garnish with dill pesto.